Sensing she was on a winning wicket, Isha took her argument all the way. "These thieves aren't stupid," she said. "They are highly trained mercenaries. Regularly facing danger. Regularly murdering others, looting others." "They are in the business of regularly spilling blood. They wouldn't just freeze with fear." "Or wait quietly for their turn to be smothered in boiling water while their brothers are howling away in pain." "And their Captain. He wouldn't just keep snoring away through all the bedlam." "Even if she woke up the rest of the household," Hosh joined in, "and they could all, quietly and efficiently pour sufficient boiling water, simultaneously on all the robbers, it will still only scald them." "It won't kill all of them instantaneously. They could survive even if they got fourth degree burns." "What's fourth degree burns?" Isha asked. "I've only heard of three degrees of burns." "Actually, there are six degrees of burns," Hosh explained. "Most people have only heard about first, second or third degrees because it is very difficult to survive a fourth, fifth or sixth degree burn." "What's degree?" asked Josh. "Is it how much it is, like we measure how much the temperature or angle is, in degrees?" "Kind of," answered Hosh. "Burn injuries are often talked about in terms of degrees. But their scale only goes from 1 up to 6, unlike angles which go from 0 up to 360." "The degree of the burn refers to the severity of the injury. Proper treatment depends on accurately describing the severity of the burn." "How can people accurately know or describe their degree of burn?" Josh asked. "They are not doctors." "It's not that hard to see the difference," Hosh answered, "if you know what you are looking for." "First degree burns are usually red and dry in appearance, and painful. They swell a little and turn white when you press on the skin. The skin over the burn may peel off after a day or two and it heals within a week. This is because these burns affect only the outer layer of skin, the epidermis." "Second-degree burns are thicker, very painful and typically produce blisters on the skin. The skin is very red or splotchy, and may be very swollen. These burns can be of partial or full thickness." "Partial thickness involves the whole epidermis but only the upper layers of dermis, which is a layer of skin between the epidermis and subcutaneous tissues. So skin in this burn may appear pink or red and wet. It will also blanch when pressure is applied. Healing can take 2-3 weeks, but usually there is no scarring." "In Full thickness, the whole epidermis and most of the dermis gets destroyed. You can still feel sensations where the skin has burnt, but not much. Wound can be red or white, but it appears dry. Blanching would be sluggish or absent. These most likely need surgery and skin grafting to heal." "Third-degree burns are dry, and look white or charred. Strangely though, these burns may cause little or no pain because the nerves and tissues in the skin have got damaged." "Since all the layers of skin are destroyed, these burns can appear leathery in texture, and will not blanch when pressure is applied. They need quick treatment and grafting and grafting, and can take a long time to heal." "Fourth degree burns extend into underlying muscle, tendon, ligament and bone after damaging all of the skin in the burned area. Very often, they are fatal. Skin grafting is essential if a patient does survive a fourth degree burn." "In Fifth and Sixth degree burns, the damage goes all the way to the bone and everything between the skin and the bone is destroyed. Due to advancements in modern medicine, we may be able to survive these today, but historically these type of burns were most often diagnosed only during an autopsy." "Interestingly, it is Plastic Surgeons who generally end up fixing the burnt skin on the body. They, and other doctors still use this burn degree system as well as the area of a burn, measured as a percentage of the body's total skin area." "The skin area on each arm is roughly 9% of the body total, as is the skin covering the head and neck. Each leg is 18%. The trunk is 18% on the front and 18% on the back." "If the 3rd degree burn covers up to 20% of the body area, most people can be saved with prompt medical attention. Elderly people and infants may however, fail to survive a 15% skin loss. Anyway, regardless of size, all 2nd and 3rd degree burns should receive prompt medical attention." "A few years ago," Rosh joined in, "a 24-year-old American, David Allen Kirwan, had jumped head first into the Celestine Pool to rescue his friend's dog who had impulsively jumped into the pool, and then started yelping." "Now that pool is a boiling hot spring with water temperature at 100° Celsius or 210°F, at Fountain Paint Pot thermal area in Yellowstone National Park." "He got pulled out immediately, but he had already gone blind. When another park visitor tried to remove one of his shoes, his skin (which was already peeling everywhere) came off with it." "He sustained third-degree burns to 100% of his body, including his head, and died the next morning at a Salt Lake City hospital. The dog Moosie, who had caused all this trouble in the first place, died too." 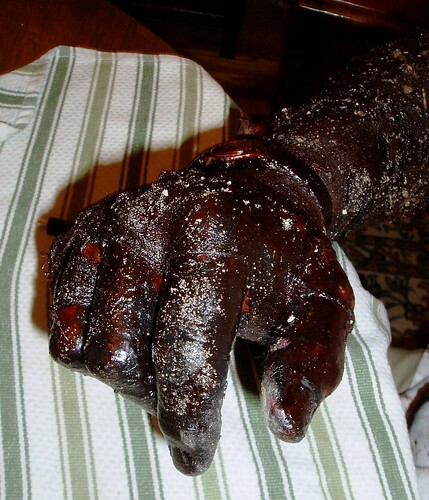 "So up until a few decades ago, 3rd degree burns covering just half the body area were often fatal. But now, people with burns covering even 90% of their bodies can survive, although they often have permanent impairments and scars." The family was quiet now, digesting all this information, and pondering what Marjina would have done in the circumstances in the Arabian Nights tale.